UltraNourish is one of the best products I've ever used, I highly recommend trying it. Did your recent doctor's visit go something like this? If you answered YES, UltraNourish may be just what your doctor ordered! 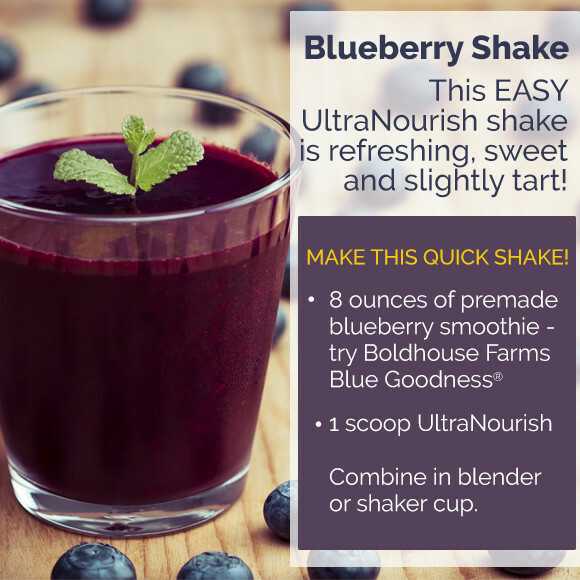 UltraNourish is a superfood, protein powder that you mix into your favorite shake or smoothie. 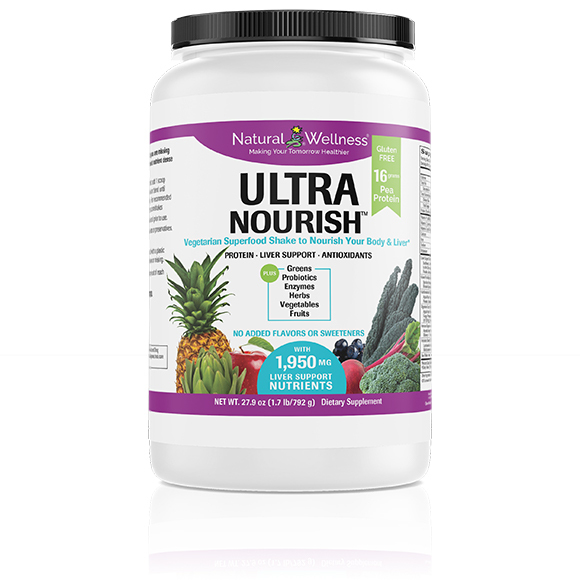 In just one scoop of UltraNourish, you'll get the fruits, vegetables, protein, antioxidants, probiotics, and more that are missing from your daily diet, all in the proper amounts necessary to maximize your health. Plus, UltraNourish, with its 1,950 mg Liver Support Blend, is the ONLY superfood, protein shake that ALSO FOCUSES ON YOUR LIVER. It's truly the ONLY TOTAL BODY superfood, protein solution on the planet. With UltraNourish, you can easily eat healthier, lose weight, and improve your liver health. Just mix UltraNourish into your favorite shake or smoothie and SUPERCHARGE every cell in your body. 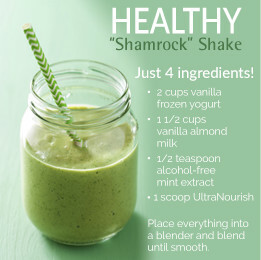 Drink it as a healthy snack or to replace an unhealthy meal. Imagine how great it would feel to regain the energy and wellness you had as a teenager. Try UltraNourish™ risk-free for 90 days. We want you to be 100% satisfied – We want it to work for you. 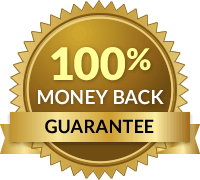 If you are unsatisfied for ANY reason, simply send it back for a full refund. No questions asked - For first time orders, we'll even pay for the return shipping. Do I Want to Improve My LIVER Health and Function? 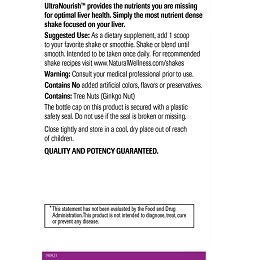 UltraNourish's 1,950 mg Liver Support Blend was developed by liver experts to support, protect, and optimize your liver function. 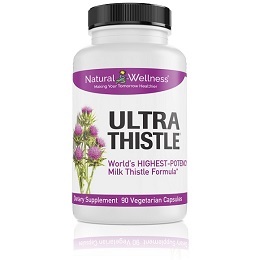 It contains 8 proven liver beneficial supplements including milk thistle, artichoke, turmeric, and chicory. 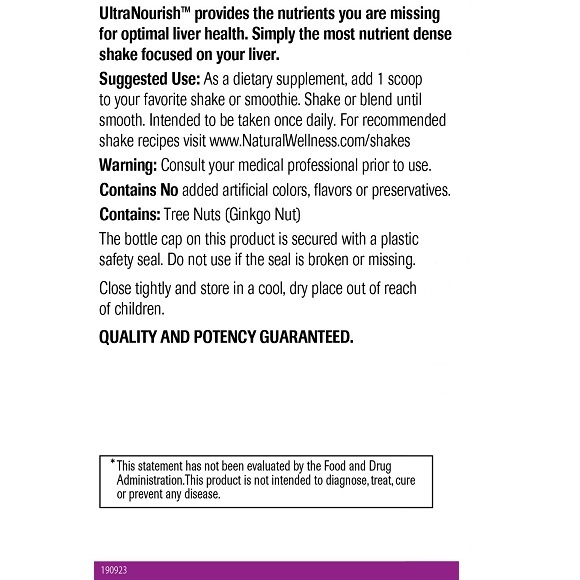 No other superfood powder or shake focuses on your liver like UltraNourish. As you most likely know, when your liver is not functioning at its best, it cannot perform its own functions well. However when this happens, it ALSO negatively impacts almost every other organ, process and function in your body. So maximizing your liver function is truly one of the most important actions you can take to keep yourself healthy today and in the future. 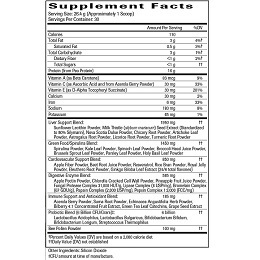 What Does UltraNourish's 1,950 mg Liver Support Blend Do for You? 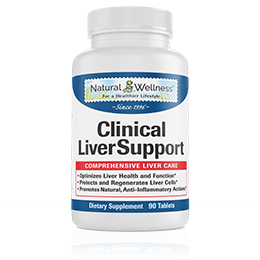 Protects your liver and optimizes its functions. Helps you produce new healthy liver cells and enzymes. Reduces fat accumulation in your liver. Helps address inflammation in your liver and throughout your body. Improves your liver's ability to remove toxins from your body. Reduces stress on your liver, heart and other primary organs and processes. Promotes better bile flow and sugar levels, which improve your digestion, nutrient absorption, fat elimination, bodyweight, and overall health. Eliminates free radicals which cause havoc on your entire body and leads to many age related health issues. You can only attain the wellness you're meant to experience when you give your liver and body the nutrients they need. Do I Want to Feel Energized, Focused and More Productive Again? Then, pea protein is an all-natural solution to your problem. Pea protein is "lean protein" and comes from the yellow split pea. Unlike popular whey protein powders, pea protein is hypoallergenic and is more easily digested and processed by your liver. UltraNourish contains 16 GRAMS of pea protein. Pea protein provides you with a complete array of amino acids, including high levels of branched-chain amino acids (BCAAs), plus essential amino acids that cannot be made by your body. 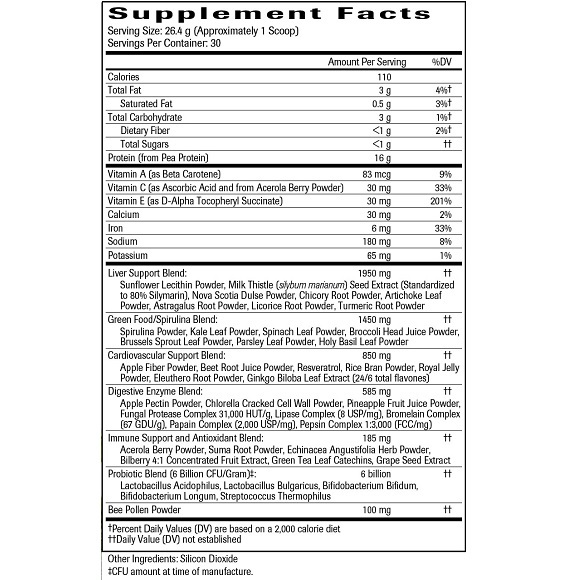 These amino acids are vital for protein creation and as a source of energy for your body. Pea protein provides you with both a pre-workout energy boost and improved post-workout muscle recovery. Pea protein also improves your focus and mental concentration. Pea protein's well-balanced profile fulfills the essential amino acid requirements for adults outlined by the World Health Organization. Do I Want to Achieve a Healthier Weight? We all say we want to eat healthier – eat more fruits and vegetables, cut down on the carbs, reduce the sweets, and eat healthy snacks. But we don't. And even when we try, we give up quickly and go back to how we ate before. Reduce your cravings and tendency to "cheat" throughout the day. Fill you up with healthy, useful nutrients. Provide digestive enzymes to help you better absorb and utilize these nutrients. Give you more energy to do what you have to do. 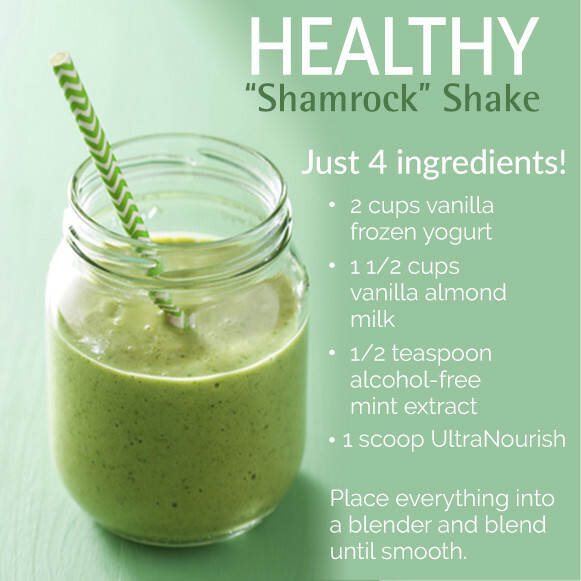 Try a shake for breakfast or lunch, or as a healthy snack. It will fill you up, reduce your cravings, and provide nutrients, antioxidants, and more to improve your health. You will feel healthier and be healthier! Who doesn't want that? How About Improving My Digestion and Reducing My Digestive Upset? Digestive issues can prevent you from eating what you love and prevent you from absorbing and utilizing nutrients. Side effects can run from simple burping, bloating, discomfort, and gas to severe diseases and even death. According to the U.S. Department of Health, roughly 70 million people are affected by digestive issues adding up to 48 million visits to a doctor, clinic, or emergency room each year. Improve your digestion of proteins, carbs, sugars, fiber, fats and even hard-to-digest foods such as dairy products, grains and legumes. Boost your nutrient absorption and utilization. Reduce your gas, bloating, heartburn, digestive discomfort, and other digestive side effects. It's time for you to start eating what you want again and feel better doing it. Would I Like to Catch Fewer Colds This Year? Nobody likes being sick, suffering from allergies, or feeling run down. Since 70% of your body's immune system resides in your digestive tract (gut), maintaining balanced digestive health is crucial to your body's overall well-being. Help you fight off viruses, bacterial infections and allergy attacks. Reduce the occurrence or severity of illness and promote a faster recovery. Create the ideal environment in your digestive tract for optimal immune function. Balance out your gut by providing you with 6 billion probiotics ("beneficial bacteria") and by inhibiting the growth of harmful bacteria. With UltraNourish, you boost your immune system from within. Is Protecting My Heart and Promoting Healthy Blood Sugar Levels Important? According to the Center for Disease Control (CDC), 1 out of every 4 deaths is attributed to heart disease. It is the #1 leading cause of death for both men and women. The major causes of heart issues are smoking, heredity, and health problems related to an unhealthy diet as well as liver and blood sugar issues. Our proprietary 850 mg Cardiovascular Support Blend may not help you stop smoking, but it can mitigate the effects of hereditary heart issues and improve your liver, blood sugar levels, and diet. Improve blood flow throughout your heart and body. Lessen the stress on your heart. Promote healthy cholesterol and homocysteine levels. UltraNourish contains the highest-grade and most potent ingredients available in their proper quantities to do you the most good. No expense has been spared in bringing you the most complete formula possible. If it's in UltraNourish, it's in there for a reason. With UltraNourish, you'll get the fruits, vegetables, protein, antioxidants, probiotics and more that are missing from your daily diet, all in the proper amounts necessary to maximize your health. Read the UltraNourish reviews from real customers, look at our ingredients, and by all means do your OWN RESEARCH. We're confident you will find our formula to be the BEST Total Body Solution on the planet. Please note: All superfood shakes taste earthy without added sweeteners and flavors. 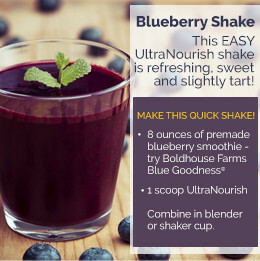 And UltraNourish, which contains 16 GRAMS OF PEA PROTEIN and EXTRA GREENS, is no exception. Knowing all this, we still developed Unflavored UltraNourish specifically WITHOUT sweeteners and flavors and it's important that you know why. First, everyone's tastes are different. Some might feel a sweetened shake is too sweet, others might think it is not sweet enough. Some may like the added flavor, some will downright hate it. 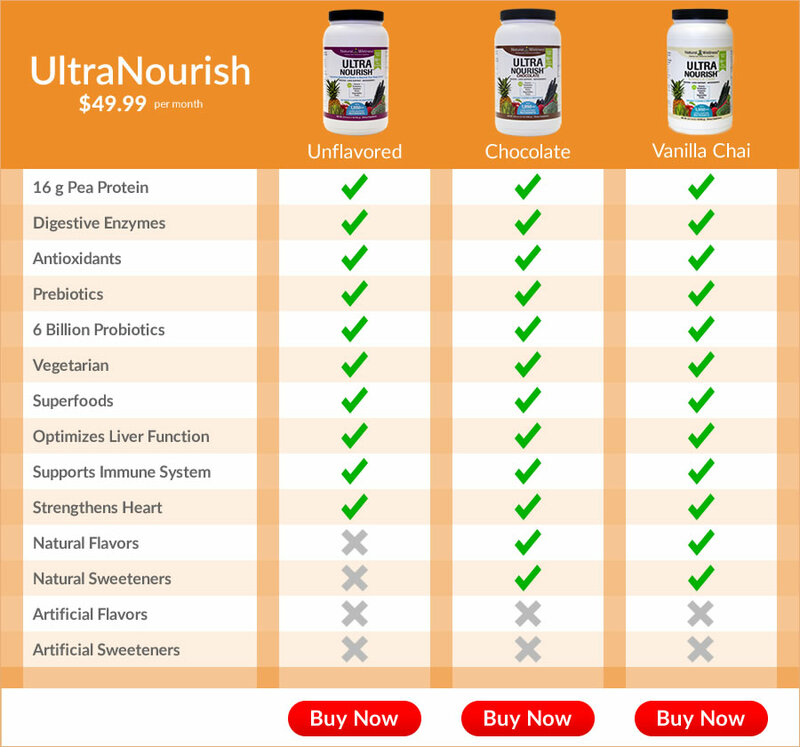 By leaving out all flavors and sweeteners, UltraNourish provides you a more customizable option than other shakes. With Unflavored UltraNourish, you can customize your shake to your liking by adding fruits, different milks, juices, cocoa, etc. PLUS you can have fun and drink different flavors each day, not the same chocolate or vanilla shake day in and day out. Try multiple recipes and find the ones that you like best. And now, with our new Chocolate UltraNourish and Vanilla Chai UltraNourish, it is even easier to make your doctor happy and you healthier. Using natural flavors, stevia and organic cane sugar, Chocolate and Vanilla Chai UltraNourish are a delicious alternative for those wanting to simplify their shake-making routine. 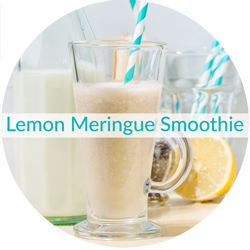 Just add water or milk, shake it up, and you have a delightfully tasty and healthy shake ready in seconds! Choose the shake that is right for you and take charge of your health today. We are very sorry to hear that UltraNourish didn't meet your expectations. On it's own, UltraNourish doesn't have the most pleasant taste, particularly because it is unflavored and unsweetened. However, when mixed with certain ingredients it can become a delicious tasting drink! Nice addition to my smoothie. UltraNourish-Gluten Free upset my stomach. I drank the chocolate Ultranourish and that was good. Returned the UltraNourish-Gluten Free. We're sorry to hear that our Unflavored UltraNourish didn't work for you, but we're glad you found our Chocolate version! Great for the flow...not the taste! This stuff tastes awful! its unsweetened, unflavored and grainy...probably cause its hard to mask the taste no matter what you put in it. If you took the "unsweetened and unflavored" literally you would think it has no taste... not the idea at all. you are going to taste something... Taste wasn't why I bought it however. I have tried what I can to mask the taste and I have gotten some concoctions to make it manageable for me and my wife. we use this to help flush things out when it gets hard for the body to manage...saying it as politely as I can. I use it three days in a row just one scoop each day and it does the trick. It seems to jump start my system and allows the flow to continue for the rest of the month. We're sorry to hear that you aren't enjoying Unflavored UltraNourish. Unfortunately, UltraNourish on its own doesn't have the most pleasant taste, particularly because it is unflavored and unsweetened. However, when mixed with certain ingredients it can become a delicious tasting drink! Or, you might wish to try out our newer Chocolate UltraNourish, which adds a rich chocolatey flavor to your shakes! I know that some people have problems with the taste. I am not one for making shakes. What I do, and I hope this helps someone, is I fill a coffee cup with grape juice and add my scoop of Ultra Nourish and stir it up real good and then just chug it back. This has worked the best for me and it has made it so much more easier to take it. You can still taste the Ultra Nourish but it is totally do able. I hope this works for you who have a problem with the taste. Just drink some water after and don't let your juice mixture get too thick. Love this! So easy on the stomach. It's very filling and helps me not only feel healthier but also lose weight! I was a Hepatitis-C sufferer diagnosed 10 years ago in 2006, and who just completed a successful 3 month treatment to cure the virus last month. I started taking UltraNourish 2 months before the start of the treatment in April, and intend to keep taking it daily for another 3 months post treatment till October 2016. 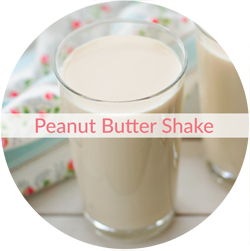 During the treatment, I found the daily shake indispensable because of the loss of appetite and general weakness I often felt. I went to work everyday during the treatment, some days albeit only for about 5-6 hours, but I did go in everyday. I did some physical exercise everyday, as in Yoga, Mild Aerobics, and Pilates throughout the treatment, and even with the loss of about 6 - 8 lbs total, my general outlook has earned me complements. I credit UltraNourish for providing me with the necessary nutrients I needed for the functioning of my body, during the treatment, especially since I stopped all oral vitamin/mineral supplements. 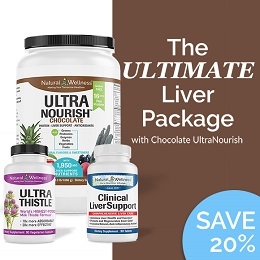 I will recommend UltraNourish not only to people suffering from Liver disease, but everyone detoxing to give their bodies a tune-up, give their liver a rest and boost, or just plain seeking to live a healthy lifestyle. UltraNourish will continue to be a part of my regimen, probably not on a daily basis, but for those times I'll need a healthy shake, a boost with detoxing, or right after detoxing, it will be part of my Wellness routine. Thank you, and keep working at it to bring more Natural Vegetarian alternatives for all of us seeking wellness. I am not a meal replacement drinker and thought I would give it a try. I am not sure what the other reviewers are doing but I think it is extremely bad tasting. I haven't been able to find anything I can add to it that gets rid of the chaulkiness. Are there more recipes out there? Because it is unflavored and unsweetened, UltraNourish doesn't have the most pleasant taste. However, when mixed with the right ingredients it can become a delicious tasting drink! Typically, superfood protein shakes are not meant to taste good, but we believe that the benefits do outweigh the unpleasant taste. We recommend trying some of the recipes we have on our website to help cover the earthy taste and texture. We've personally tried out all of the recipes and they definitely help to mask the taste and texture. You might also want to start out by using less than a full scoop until you find the right amount that works for you. I was looking for a pea protein supplement for my breakfast shake (instead of whey) and post workout meal. This gave me everything I need for a good price per scoop. I loved all of the other nutrients included. The taste is pretty good. I love it when mixed with mixed berries, and peanut butter. UltraNourish is a great product and contains key ingredients to keep you happy and healthy. If you are always on the go, it will make a great meal replacement to take along with you. I feel great after taking it and my favorite ingredients to blend with are: almond milk, a banana, and 2 scoops of cocoa powder! At work, I usually get take out for lunch from the local pizza shop or gas station. I tried this because I figured it would be healthier and save me some money. I've been having it for lunch most days now and have been pleasantly surprised how much more energy I have in the afternoon. I like 1/2 banana and a couple scoops of peanut butter in almond milk, fills me right up most days. I've tried a LOT of whole-food, high-absorption-bioavailable superfood Products. Nothing makes me feel as good as Ultra Nourish. My favorite drink is mixing ultra nourish with apple strawberries and peanut butter. I drink ultra nourish every morning as a meal replacement it makes me feel energized and i have a sense of well-being. I tried this with blueberries, a banana and almond milk with honey. The Ultra Nourish powder does add some chalky-ness to the mix, but it's not overpowering. It's pretty filling, I could see it being a light meal replacement (breakfast or lunch). For maximum health benefit, UltraNourish is unflavored and unsweetened. Due to its high superfood content, we recommend mixing approximately 1 scoop of UltraNourish to your favorite shake or smoothie. Intended to be taken once daily. For tasty shake recipes to use with UltraNourish visit https://www.naturalwellness.com/nwupdate/category/recipes/shakes/. Get your greens with this MUCH healthier option than the fast-food version. 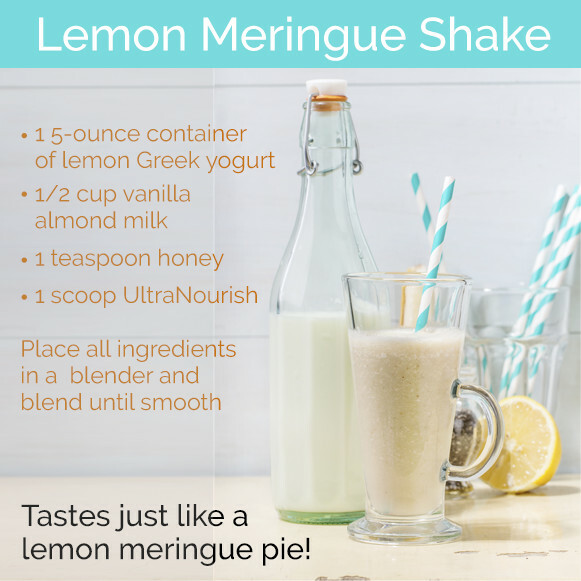 This recipe really wowed our taste testers with a very nice minty taste and the perfect amount of sweetness. 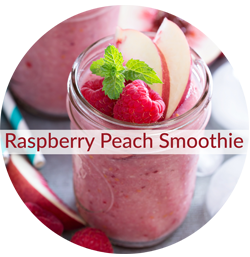 Place everything into a blender and blend until the coconut oil is emulsified (about 10-15 seconds). It will end up looking like creamy coffee. Pour into a cup and enjoy immediately! Click here for more UltraNourish recipes! Unflavored UltraNourish™ is MANUFACTURED in the USA to meet FDA strict current Good Manufacturing Practice regulations (cGMP).